For those who can't get enough of Blokus! It's a "chip off the ole Blokus," but with a super-challenging twist! A new dimension of triangular-created Trigon pieces must be fit, tip to tip with your own pieces, on the hexagonal game board. Angles jut in every direction, so new strategies are always evolving. It's the Bermuda Triangles (486 in all) of strategy games. Think carefully! You can block-and be blocked-at any moment! Quick to learn, challenging to master. 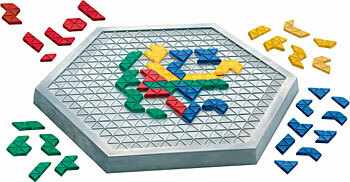 Includes recessed game board, 88 Trigon pieces in four bright translucent colors, and guide. Playing with pieces made of triangel instead of squares actually makes a much bigger difference to the game than I expected. Spotting moves is somehow more difficult with triangles, which leads to more challenging and varied gameplay. Also, it plays perfectly balanced with 3 players. Changing Blokus to a triangular grid doesn't sound like much of a change, but it adds an extra dimension in allowing corner-to-edge play as well as corner-to-corner. This makes it harder to restrict one targetted player, making the whole experience much more subtle. The perfect abstract for four. There's a reason this seemingly cloned version of Blokus exists - it's so much harder! The rules of the game follow exactly from the original, but try figuring out the best formula for your insane triangular pieces... I love it. It's perfect with three players, obviously, as Blokus and Blokus Duo are perfect for 4 and 2, respectively. A great four player game. Changing the blocks into triangles is challenging though. It takes more focus to watch your opponents and execute the correct placement. A must have for Blockus fans.